In many interviews we may asked to substring() a string without using substring function from String class. Below are the simple code how we can write our own substring functions similar to String class functions. This is one of the simple interview question that need to calculate String length without using length() function. There are lot of ways to find the find the length like converting String to Character array and by iterating it. Lets see simple java code to calculate string length. We all know String class in Java is immutable and the value once stored in String Object can't be modified. Also we have discussed about this in our earlier tutorials like difference between String, StringBuffer and StringBuilder and how to create user defined immutable class in Java. We will see how "==" equals operator works on String Object. We know that when we apply "==" equals operator on Object it will check only the Object reference rather than values stored in the Object. So using "==" on string Object will result incorrect output and advised to use equals() method which internally overrides hashcode() which will check the values in the Objects using hashing algorithm and gives the correct output. In this tutorial we will see about how "==" equals operator works internally on string Object with different scenarios. 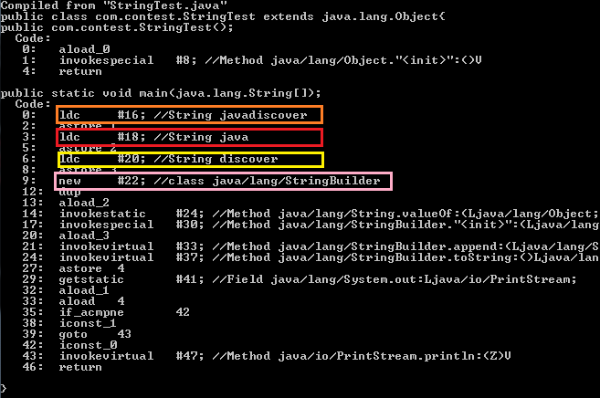 We can see in above disassembled code from Java class file, both String references are same. So when we compare these string Objects with "==" operator we will get true. We can see both the string Objects are referred by same reference. So we are getting true when we compare by "==" operator. From above code we can clearly see first 3 string objects are having different references. But 4th "Str4" String in java file contains same value of 1st String "str1" but JDK has created StringBuilder class instead of String with different reference. Hence we are getting false when we compare "str1" and "str4" with "==" operator.